Chowing down on the day’s catches as the sun set on the beach was a satisfying end to our private boat adventure inside the reef off Ambergris Caye, Belize. 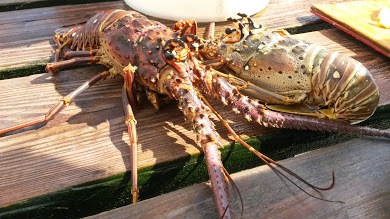 Especially rewarding was catching the reef fish used to make the ceviche and diving for the conch as well as the lobsters from Captain Tony’s secret, personal traps. During our regular family trips to Ambergris Caye, we always book a day with Tony Calderon for snorkeling, fishing, and lobster-hunting. Being a lifelong resident, Tony and other captains like him, know the best uncrowded spots for reef activities. While the four of us fished with varying success, Tony masterfully pulled up one fish after another by lowering the fishing line by hand with only hook and bait attached. All the while he cheerfully helped us with bait or snagged lines. 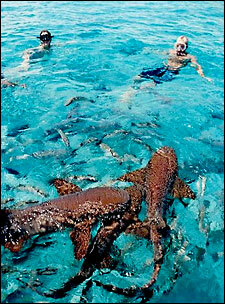 After fishing, we snorkeled with the vibrantly-colored reef fish and then swam with rays and harmless nurse sharks. We learned how to identify which shells had living conch and which did not. Diving for lobsters was teamwork with attention to making sure not to get “clawed” while tossing the lobsters in the boat. At the end of the outing, we relaxed with drinks while Tony started a fire with coconut husks in the old-halved barrel where he planned to cook the lobster. 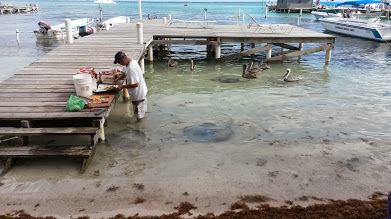 When the coconuts collapsed the rusted out bottom, undaunted, he laughed and flipped it over, using the lid to finish cooking the lobster and sides. The only disappointment was I’ve yet to get Tony’s famous, secret lobster sauce recipe, although I did get a photo of the ingredients he used.